Thanks to one of our Fabulous Finders, Dawn has found her moose. 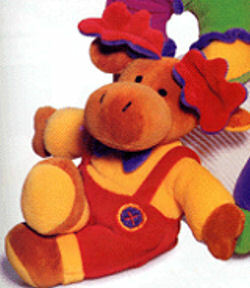 I am looking for the Mary Meyer Moose called Romper. He is red and yellow and has a purple bow tie. My daughter got one when she was born 10 years ago. He has been with her every night since birth, no matter where she is. Needless to say “Moosie” has seen better days. I would love to find another one. Any help would be greatly appreciated. I have been searching everywhere for the moose. No luck for me. Hopefully you will have better luck. Post code 051209-3 Brenda: Thank you soooo much. This was the correct moose and I have just received it today. I am so excited. Thanks again. Can’t wait to see her reaction when I give it to her.